I participated in something last week I think is pretty cool. It’s The ‘I Am’ Project started by Alli Worthington – a collection of self-portraits taken by women from across the web. More than just submitting a photo, Alli asked women to finish the sentence, “I am ____” with whatever comes to mind. The outcome is a photo collection celebrating the unique stories, identities, funny and not-so-funny moments of a phenomenal community of women. Today, Catherine Connors challenged readers to finish the “I am ___” sentence, something we should all consider doing on a frequent basis. It’s a nice tie back to what Catherine challenged attendees of last month’s Blissdom Canada conference to do. To interrogate our knowledge of ourselves. Because self-knowledge and a no-holds scrutiny of our identity helps us to define our voice. I’ve been working on that self-interrogation. Haven’t finished yet but I’m learning to recognize a few things. Like that I can sometimes be really bossy to my husband. And that while I don’t think my writing style is as funny or pithy as I’d like it to be, it’s my own. That even when I do bad mother things (like getting distracted by Instagram instead of colouring with DD, or giving in to her requests for a second glass of chocolate milk), I’m still a good mother. Yes, I am a great mother. Oh another thing I’ve learned? I am a really slow knitter. Like snail slow. Here’s a confession for you though – while I think the ‘I Am’ Project is super cool, I almost didn’t submit a self-portrait. Why? Because I didn’t think my self-portrait would be of interest. I was letting self-doubt blind me to the whole point of Alli’s project. Instead of interrogating my self-knowledge, I was questioning my value. So I clamped that thinking down and made a submission. And I’m glad I did. If this project intrigues you, read Alli’s article to view the full gallery of self-portraits, then leave a comment on the post letting her know you’d like to participate. Help Alli keep this movement going! You’re so right. We’re all guilty of that self-doubt. Glad I kicked it to curb! 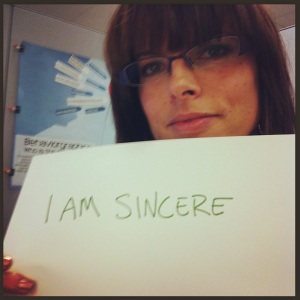 Yes you are sincere! You are a great lady! Love this project! Thanks Susan – hope you decide to participate too! Good for you for not letting self-doubt stop you. This makes me crazy happy. Thanks Alli! Your words mean a lot!